After our morning at Mount Fuji and afternoon at Owakudani sulphur pools and the Hakone ropeway (see my previous blog post if interested), we headed on to Hakone itself to try an onsen. In Japan, hot springs (or to use the Japanese term: onsen) are both prevalent and popular, and can include indoor or outdoor baths. 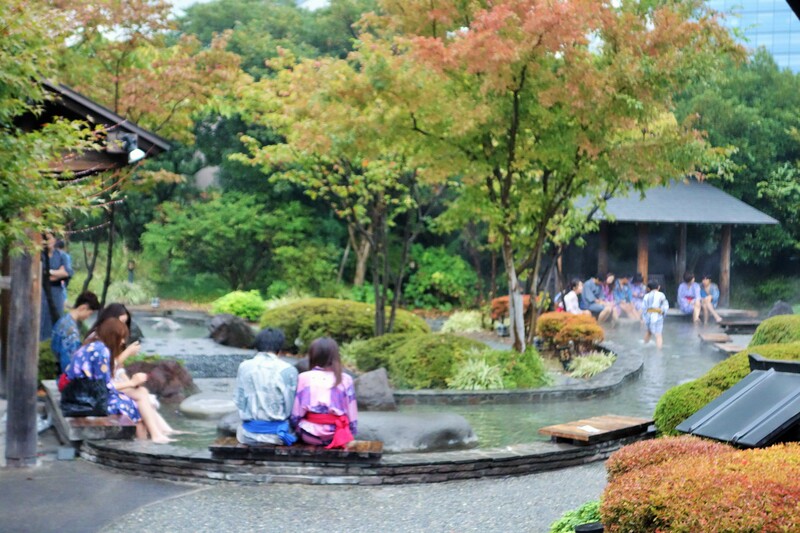 There are also often sauna or steam room facilities located nearby and the hot springs themselves traditionally link to sulphur vents in the Hakone area. Initially, the procedure of bathing in a hot spring sounds fairly akin to bathing in a Jacuzzi in the UK (at least it did to me at first). But in spite of some similarities, there are a few rules enforced in a Japanese Hot Spring which set the two apart; for one thing, if you have a tattoo (no matter how big or small), you are prohibited from entering a hot spring (or at least one which upholds traditional values, and most of them do). This is because tattoos are associated with gang culture (yakuza) in Japan. In addition, concerns over swimwear are irrevelant because bathing in a Japanese Hot Spring requires you to go completely naked. It is important to note also that the onsen are split by gender (an onsen for females to access, and a different hot spring for men to use). The first onsen to visit was an onsen inside the Hakone Kowakien, the hotel which provided our post-Mount Fuji tour accommodation. 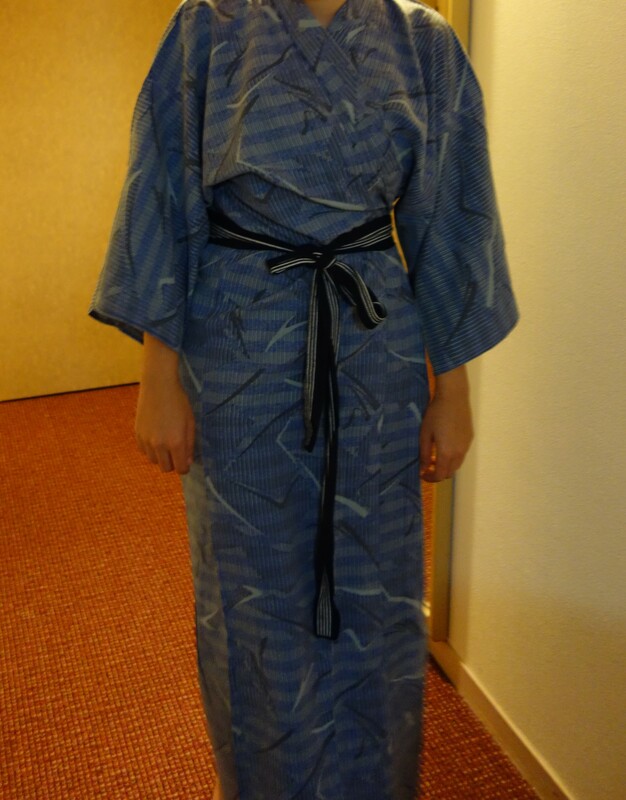 On the two beds in our room, fetching yukatas (blue and patterned) were provided, and people wear these around the communal areas of the hot springs. 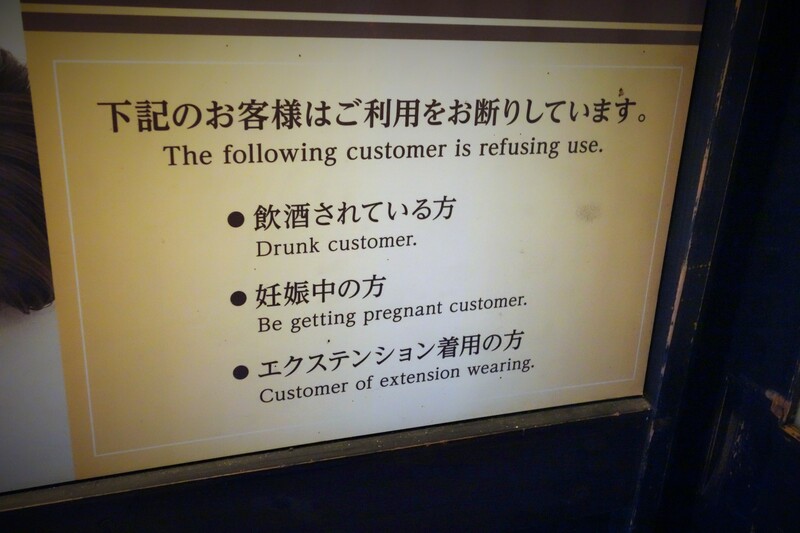 Near entry, a sign specifies how you are forbidden to enter if tattooed, drunk or pregnant. For the most part, when I swim at my local public swimming pool at home, it is natural to change in a cubicle and for people to have a generally more conservative attitude regarding getting changed. Though swimming and bathing in an onsen are two very different entities, the Japanese women in the changing room had no reservations about being naked and there were no cubicles to change in. In spite of the sign outside saying that you should bathe “au naturale”, an Australian women I had met on the tour earlier in the day refused to take her white bikini off and seemed surprised when I complied with the onsen rules. But to be honest, you’re going to draw more attention to yourself in an onsen if you wear swimwear than if you don’t. And in the second onsen we visited (more about that later), you were explicitly forbidden to enter the hot springs wearing swimwear. I know this because another lady tried to take large towel into the bathing room instead of a small one (to cover up) and was told she was only allowed the small towel in the onsen. So I dread to think how the onsen attendant would have reacted if the same lady tried to enter the bathing room in a swimsuit. At Hakone Kowakien (the first onsen visited), the hot spring itself is a medium-sized rectangular pool, with glass windows on one side overlooking lots of plants. The pool itself was heated to 41.9 degrees Celsius and before entering the pool, you wash yourself using metal bowls dipped into warm water (in a kind of wooden washing station). 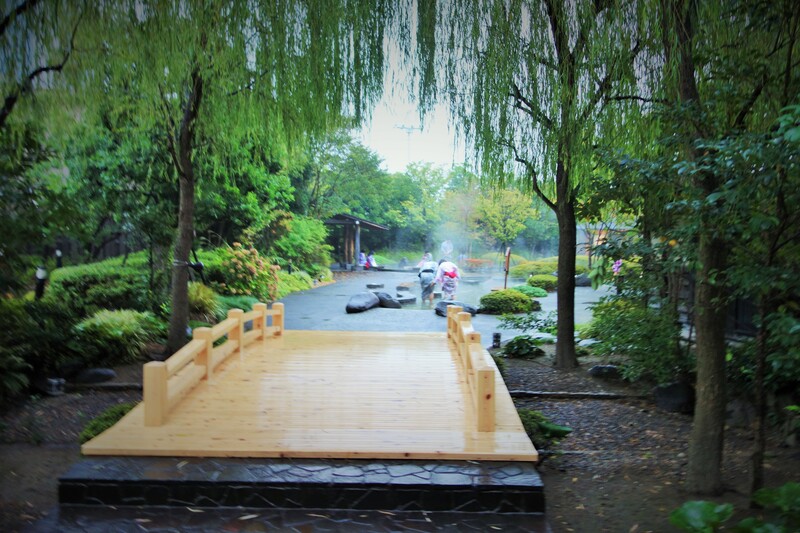 The mood at this hot spring was much more quiet and relaxed, and there were only three other women bathing when I entered the onsen room. After twenty minutes, I was looking a bit lobster like (my skin reacts fairly quickly to heat) and I decided to get out of the pool. The washing station at both onsens involves sitting on a stall (in a line of women also sitting on stalls) and washing your hair and body using a shower head whilst seated. Each station has mirrors, and shampoo and body wash are visible in large cylinder containers. 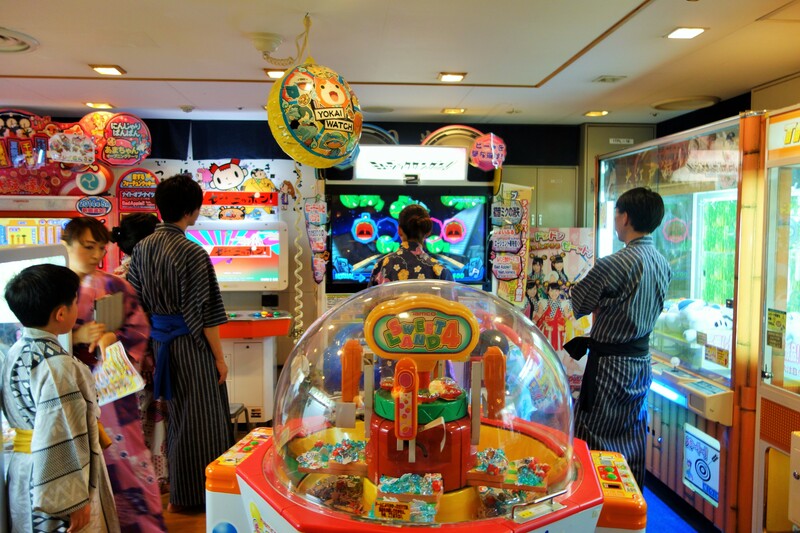 After that, you can either change back into clothes or back into your yukata to head back to your room. We then separated into our respective hot spring changing rooms. The female changing room was far busier than the one at the hotel, with attendants here being very strict on onsen rules but also being very helpful towards the singular Western girl in the room (hi) who had no idea where she was going in this brand new hot spring facility. Similar to the onsen inside the Hakone Kowakien, this one had a wooden stand full of warm water to pour over yourself before entering one of about eight potential hot spring pools inside a large hall. These ranged in temperature from 28 degrees Celsius to 42 degrees Celsius and also ranged in size- some are more like a Jacuzzi, others are the size of a small children’s swimming pool. The norm is to wrap the small towel you are given around your head when you are in the onsen (so it stays dry) and then to use it (I guess) to maintain some form of modesty when walking around (but it really isn’t a large enough towel for that to work- think the size of those face or tiny hand towels you can buy from Primark and you’re not far off). The outdoor hot springs were my preference. Here, instead of simply being wooden pools, the bathing areas are surrounded by rocks and (again) plants, and the cooler air provides a nice contrast to the warmth of the water. Bathing outside was also far less busy, though this hot springs was generally less peaceful since many visitors were bathing in groups and therefore chatting whilst relaxing. Should you wish, you can also use a steam room but I’m not a fan so chose not to do this. After bathing for a while, I met up with my friend in the communal area. By this time, it was early evening so after a snack, we decided to head out to the foot bath again. Brief pause for something my friend noticed- you are not meant to enter hot springs drunk but the Oedo Onsen Monogatari facility serves alcohol in the communal area so technically that doesn’t really make much sense. But it’s good if you fancy a beer. 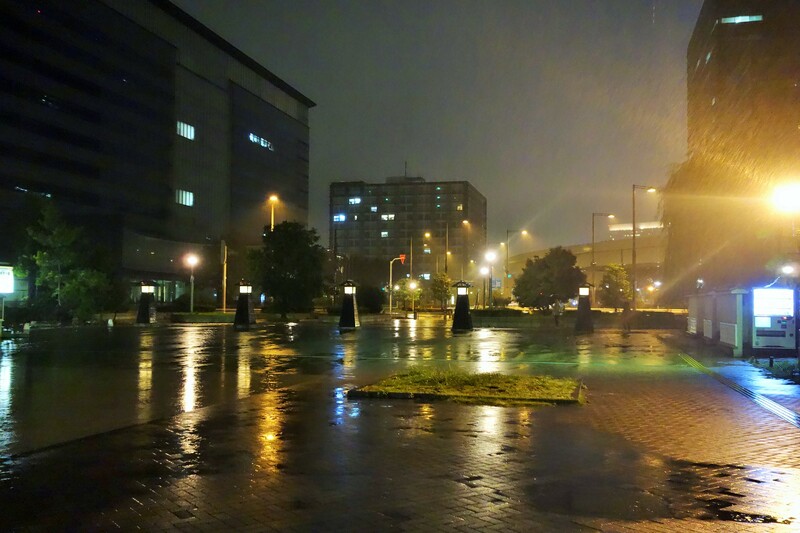 And the brief period of time we were outside that evening was a good moment within the Tokyo part of our travels. I had no camera with me and, without sounding lazy, didn’t want one (it lay locked in the changing room). I love taking photos (hopefully you can see it from my blog posts) but sometimes it’s better to just hold an image in your mind from memory. So I thought maybe I could describe the scene to you instead. The sky had transitioned from an inky blue nearer to black, and a wooden hut adorned with fairy lights held visitors who wanted Garra rufa (a.k.a. doctor fish or nibble fish) to eat away the dead skin on their feet (I know, not sounding that pleasant so far but bear with me please 🙂 ). Behind this cute little hut, a high rise building provided a reminder of Tokyo’s primary identity as an urban city yet in the foreground (which dominated most of the line of vision) lay vegetation and a stream of clear water. The path to walk along (or the foot bath) was adorned with different shapes and sizes of rocks, rooted into the ground and providing different levels of comfort and tension as you follow the bends of the footbath. Swirling above the rocks is water at a range of temperatures-from lukewarm to very hot- with the steam dancing under the small but strong specks of outdoor lighting. Wooden benches lined some parts of the foot bath stream and gentle rain drops cooled our faces as our feet and ankles were submerged in the water, hands gently holding our Yukatas at knee level. This was the literal calm before the storm, the beauty before the fury of the typhoon that we knew would hit Tokyo that night, and we sat under large clear plastic umbrellas (courtesy of the onsen) drinking in the ambience. For 10 minutes, we sat in silence. 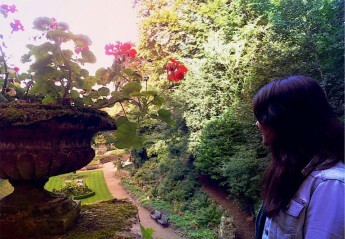 It was gloriously peaceful. And even when more onsen visitors threatened to burst the bubble and joined us outside, talking and laughing in their groups, all was fine. Because this was just a little burst of energy adding to the oasis. I could have stayed for hours but it was the more sensible thing to do to head back to Ikebukuro before the typhoon hit. Did I enjoy my two hot spring experiences? Yes. But were they a favourite for me? 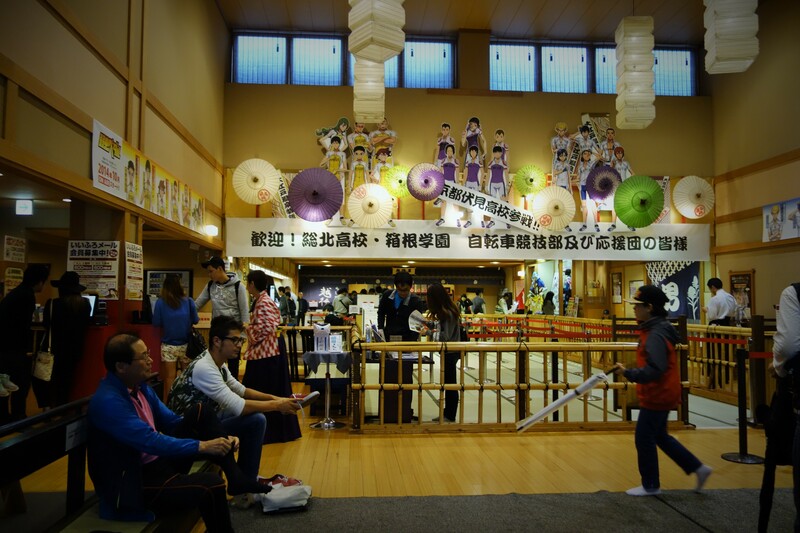 Probably not, although I know that the Oedo Onsen Monogatari was a favourite for my friend. 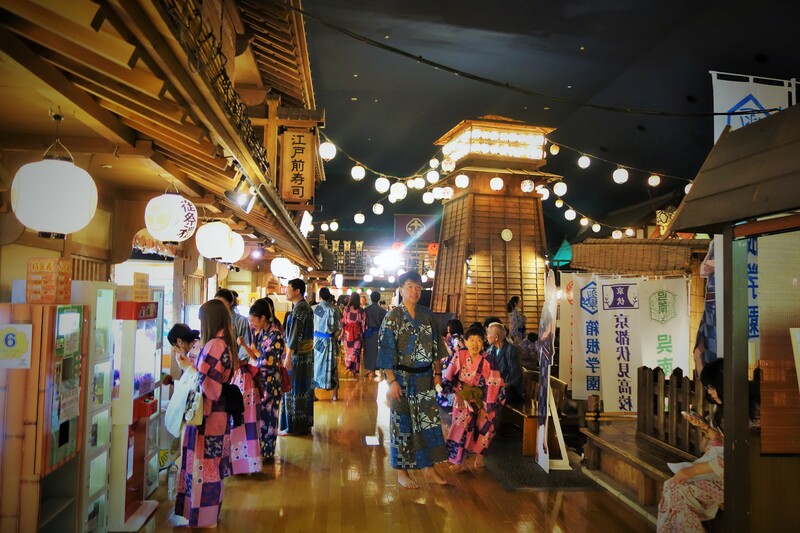 It’s something to experience which is very typically Japanese and is rewarding for anyone who wishes to submerge themselves more into Japanese culture (and some very relaxing water). ← Seeing Mount Fuji and our first (and only) organised tour day in Japan.